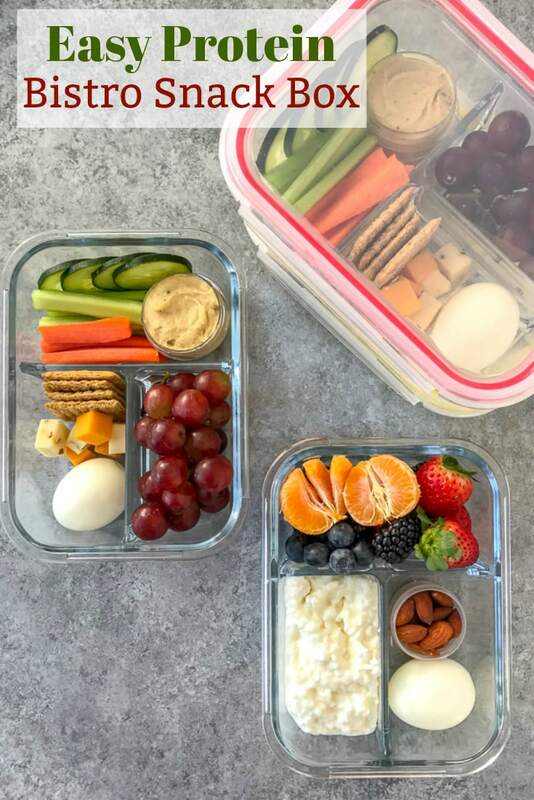 Easy Protein Bistro Snack Box – if you’re looking for a super simple and quick meal prep option that you can have for breakfast or as a snack, then look no further! This bistro box comes together in 15 minutes or less. Meal preps like this, or my Skinny Taco Salad – Meal Prep, are great for lunch, as a post-workout snack, or if you live a life on the go! 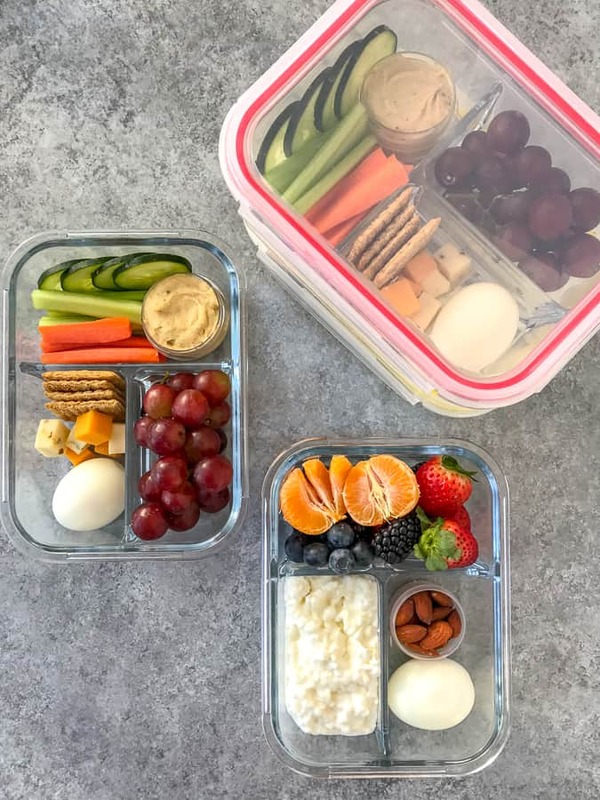 Stop spending so much of your money and time standing in lines to get your protein-packed bistro box and start making your own! Not only will you save money by doing so, but you can also add the exact ingredients that you want and it will be ready for you when you leave the house, saving you the time and frustration of standing in line, as well. Don’t get me wrong, when I am busy with work, traveling somewhere, or ill-prepared for the day, I love stopping at Starbucks to get an egg-feta wrap or one of their bistro boxes. They are such a convenient and healthy snack option when in a pinch. Especially when there is a Starbucks at every corner and in every town/city. But what I don’t love is the money spent! Especially when most of the ingredients are items that find their way into my grocery cart almost every week. So with New Years Resolutions in full force – start making your own, save money, and stop with the excuses! 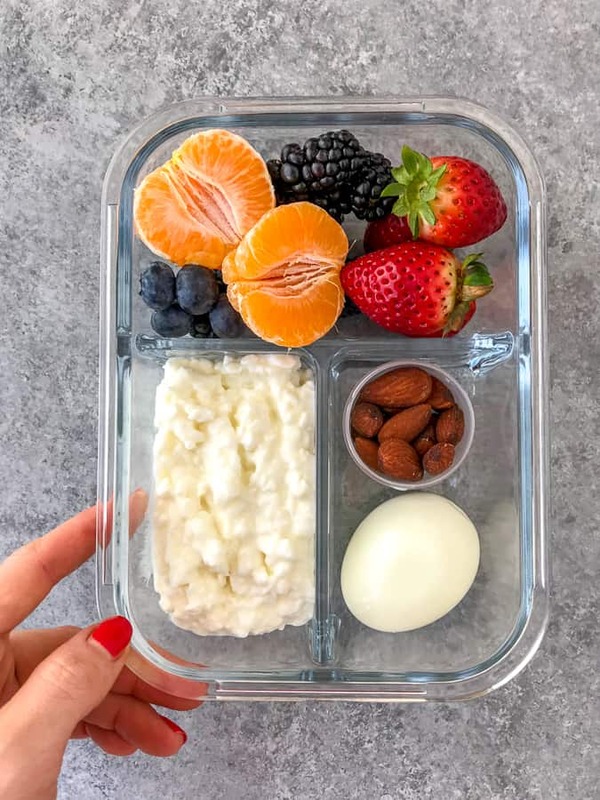 Making sure that you have a healthy breakfast or snack options is the fool-proof way to stay on track with your health goals, diet, New Years Resolutions, etc. 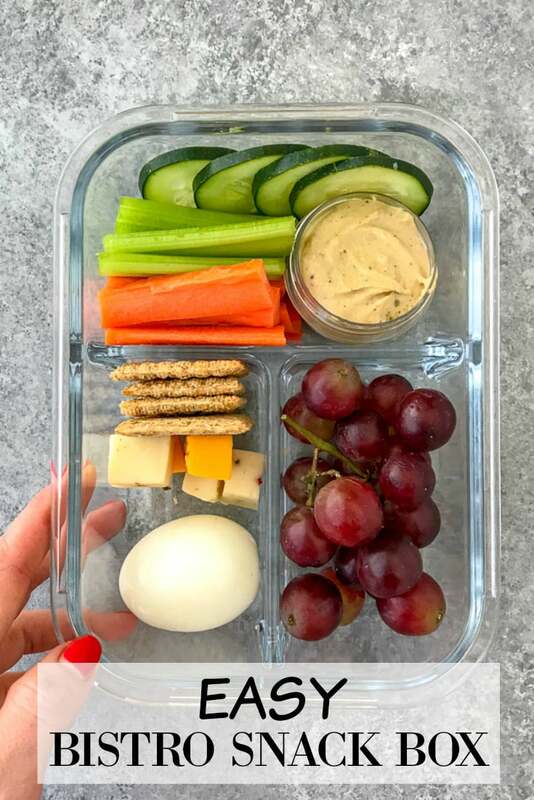 This simple and quick Easy Protein Bistro Snack Box option is a great go-to and I guarantee you have most of the ingredients in your kitchen! I do recommend getting some re-useable meal prep containers that you can use for cold or hot meal prep (no heating plastic or adding to the landfill!). I also use divided glass meal prep containers, which are wonderful if you want to keep wet and dry ingredients from mingling. Also, use re-usable dressing containers for storing your nuts, seeds, dressing, or sauces. 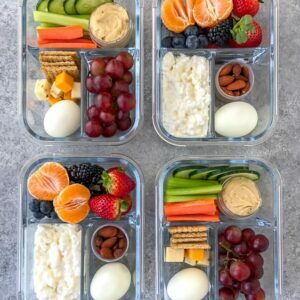 These Bistro Snack Boxes also use homemade hard boiled eggs! Learn how to make Instant Pot Hard Boiled Eggs with this proven, fool-proof method and I guarantee you won’t ever waste your time making them on the stove again! Not to mention money buying the store-bought ones. The great thing about these bistro boxes is that you can add whatever you would like! Bistro Snack Box 1: Cucumber slices, 1 carrot (peeled and sliced), 1 sliced celery stalk, side of hummus. 1 hard boiled egg, 1 ounce of cubed cheese, 1 cup grapes, 4 Triscuits (or crackers of choice). 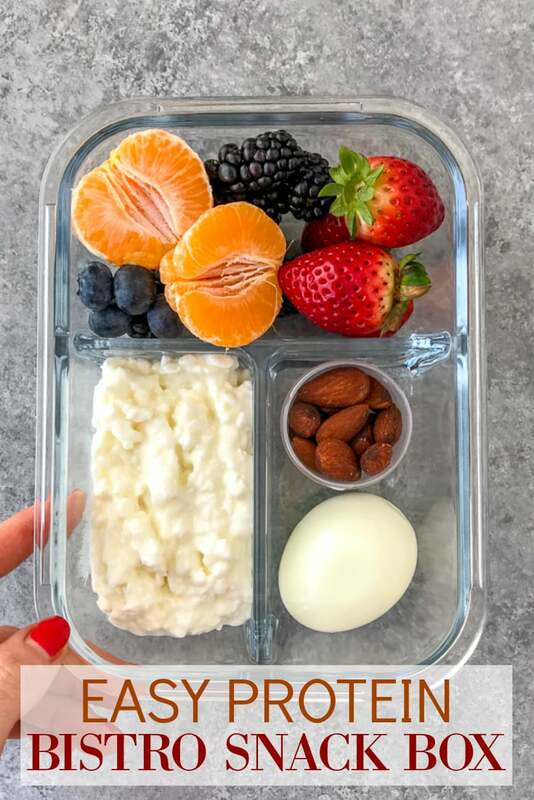 Bistro Snack Box 2: 1 mandarin orange, 1 cup of berries, 1 hard boiled egg, 1/4 cup of almonds, 1/2 cup cottage cheese. Not a fan of the fruit pictured or listed? Add the fruit of your choice! Raspberries, peaches, apple slices, banana slices, pineapple chunks, etc. Swap the cottage cheese for greek or skyr yogurt. Not a fan of almonds? Swap for walnuts, pecans, pistachios, cashews. Just make sure they are raw or at least lightly salted. 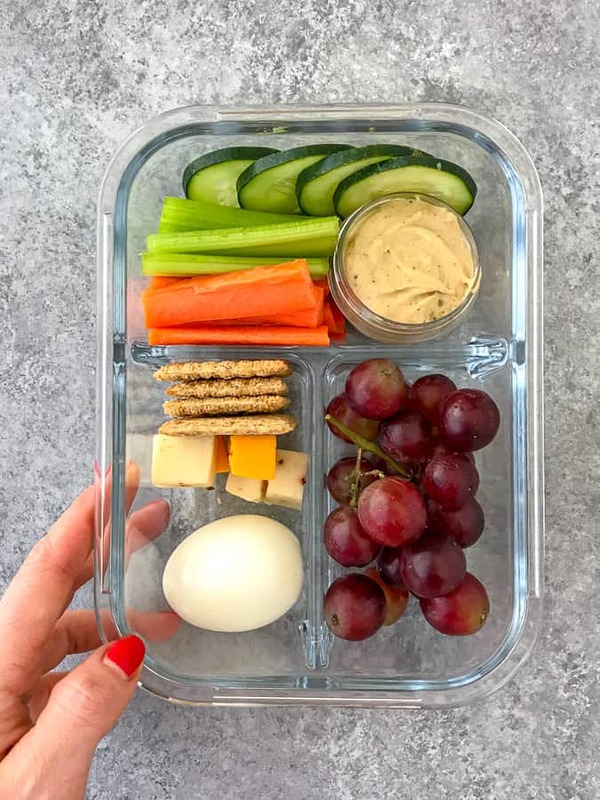 A super simple, quick and delicious meal option that is perfect for a post-workout snack, for lunches, or if you live a life on the go and need healthy options at your fingertips! Comes together in minutes! 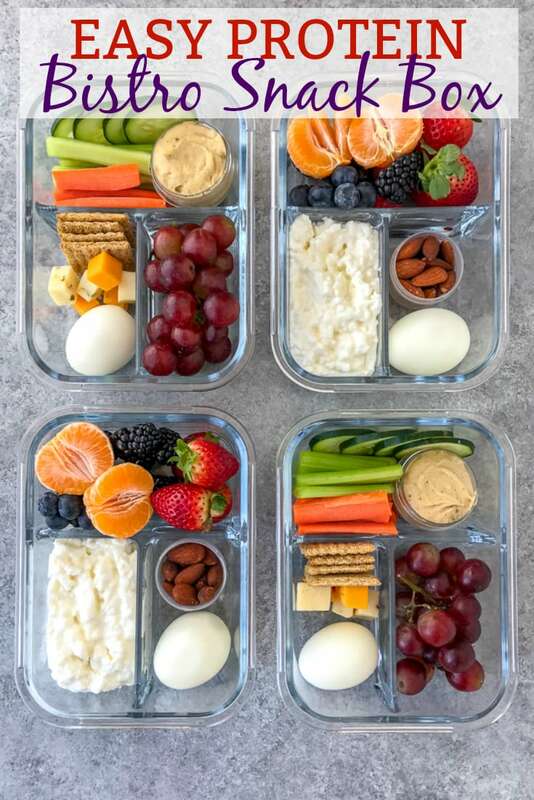 Assemble bistro boxes by dividing the ingredients evenly into 4 meal prep containers. Keep refrigerated. I recommend storing the hard boiled eggs unsliced (whole) to prevent the yolk from drying.